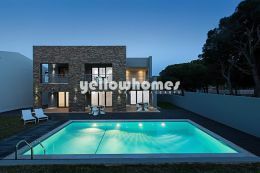 For sale- this spacious, fully furnished property is set in the Algarve on a large plot with over 3000 m2 just a few hundred meters from the beach. This fantastic and large 6 bedroom villa is perfectly located offering all amenities only a stone throw away and would be ideal for either a large family to live all year around, or as an investment for holiday rentals, or as a Bed and Breakfast business. The villa has a successful rental history. The house consists of 6 bedrooms and 6 bathrooms (4x en-suite) with various terraces and balconies, plus a cloak room. The property comprises a fully fitted and equipped kitchen with patio doors opening up to the pool and garden area, here is also access to a laundry room with washing machine. The very large, open plan living / dining room offers a built in bar and access to the terrace. Furthermore there is a large roof terrace from where you have stunning views towards the Ocean and surroundings. A large basement with natural light offers more space and is currently used as a gym and a games room with a full size snooker table, table football and darts. Additionally there is a wooden house / mobile home with approx. 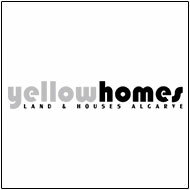 60 m2 offering a kitchen, a small living room, a bathroom and 2 bedrooms (not officially registered). The villa has fully air-conditioning for heating and cooling, double glazed windows throughout, solar heating for hot water and alarm. On the outside there is a private, L-shaped heated pool (by heat pump) and an outdoor barbecue, plus a lovely garden with automatic irrigation, a carport and garage. This is a unique opportunity to acquire a very large property in an excellent location which is being sold fully furnished and equipped. Excellent value for money with the best beaches so close. Energy certificate class C.